Chevrolet Volt teaser image | What Car? It won't be on sale until 2010, but Chevrolet is already ramping up interest in its Volt electric car by releasing a teaser image. The photo of the front corner of the car gives little away, beyond keeping the car in the news. 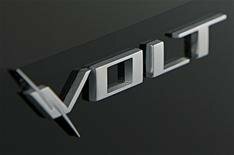 Reports suggest the Volt will go on sale in the USA in 2010, before coming to Europe in 2011. It is expected to cost around 20,000 in the UK and you'll spend around 150 a year at current electricity prices to run the Volt for 50 miles each day. Reports also suggest the European version of the car could be built in the UK. For more information on the Chevrolet Volt, click here.